"One Life: Dolores Huerta" will highlight the significant role of this Latina leader in the California farm workers movement of the 1960s and 70s. This eleventh installment in the "One Life" series is the first devoted to a Latina. It will illuminate Huerta as the co-founder, with Cesar Chavez, of the United Farm Workers (UFW), and highlight her position as the union's lobbyist and contract negotiator. Huerta was instrumental in achieving major legal protections and a better standard of living for farm workers, yet she remains largely under-acknowledged in history. The exhibition is the first in a national museum to draw attention to her contributions. Opening in July 2015, the exhibition will coincide with the 50th anniversary of the September 1965 grape strike launched by the farm workers movement. Taína Caragol, curator for Latino art and history, is the curator for this exhibition. 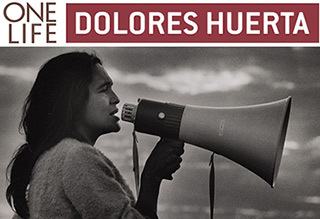 Traducción en español de las leyendas de la exposición "One Life: Dolores Huerta"
Download exhibition labels for "One Life: Dolores Huerta"
The Guide By Cell mobile applications have been made possible with support from the Philip and Elizabeth Ryan Fund. View the museum's new exhibition spaces and layout.